Eating Like the French Kids: Veggies! They serve the vegetables FIRST. If you are following the rule we discussed last Friday of no snacking, then your kids are going to come to the table hungry. And hungry kids eat! Even hungry, the French love their food. They are not serving up plain, boiled cauliflower to their little ones. They make their veggies both look and taste good! Color. Variety. Appetizing. Fun. Keep these key words in mind when serving up your little ones’ plates. Just as I stated with the “no snacking” rule, this in no means happens EVERY DAY at our house. We are busy people with busy lives, and exceptions and rule breaking are a given here. However, whenever possible, this is how I try to incorporate the French ways into our daily routine. As the main course is finding its final touches, I start the kids our with an “appetizer,” i.e. veggies! Some favorites at our house: carrots, celery, and hummus; light salads with their favorite toppings; baked broccoli and cheese… well, any veggie with cheese is always a winner! The choices of fun vegetable displays are endless here, from simple smiling veggies to entire veggie trees. Go ahead, have fun with it! Ours usually look no where close to the photo, but my kids are always forgiving, and somehow still pleased! I cannot begin to tell you how well my kids eat something when they made the dish themselves. One huge winner here is salads. I set out an array of topping choices and let them go wild. They tend to find their masterpiece much more tasty than when mom makes it up, and therefore gobble up much more of it. There are days we skip the “appetizer,” and yet the kids get a great variety of nutrients, since they are mixed right into the main course! Soups, casseroles, stir fries, crock pots, it is so easy to have those veggies there, if only taking the time to do it–which I am the first to admit is not always the easiest! Find the family favorites and put them into regular rotation. It simply does something to a mother’s soul when her kids down an entire bowl of cauliflower soup! The French love their kids to try new foods, but if the child does not like it, they do not make them eat it. Simply try again another day. The famous saying around our house comes from our favorite book Green Eggs and Ham , “Try them, try them and you may! Try them and you may, I say.” We give everything a one bite try, many times reading the book first to give the taster the courage to do so! 🙂 If the recipient does not want to take a second bite, that is his or her choice. I always make sure to keep the favorite vegetables on a constant rotation, and also within easy eye level access in the fridge. The new favorite here are yellow cherry tomatoes. The kids will often open the fridge and start popping them in their mouths. And this is where an exception to the “no snacking” rule is a definite must at our house! Believe it or not, French kids do not have some “you like vegetables” written into their genetic code. It is a matter of parenting; of opening up those taste buds early on in life. So, what are you waiting for?? Give it a try! See what works and doesn’t work for your family! And then, let me know all about it!!! I completely agree with the food practices you are setting in your house. As a mom to a 2.5 year old growing up in Costa Rica, our food is very fresh and local. In fact, the imported and unhealthy snacks I know as an American tend to be overpriced and not even worth the penny when I could buy something healthier and local to the area. 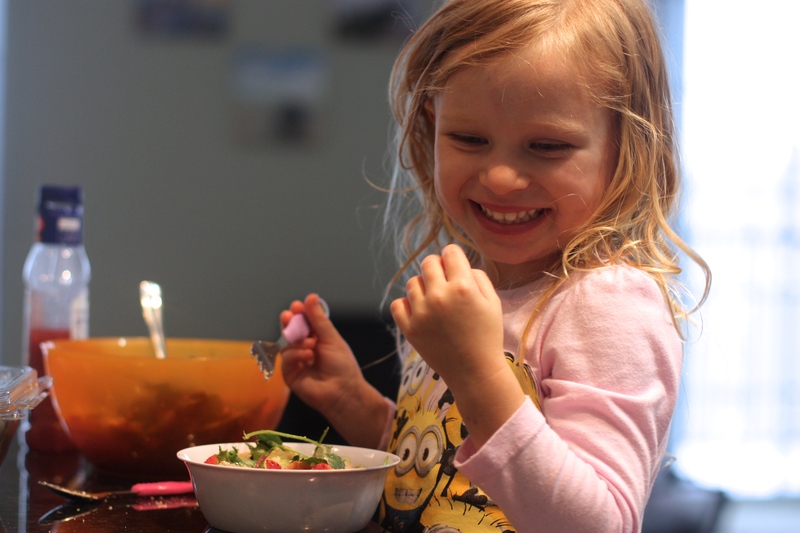 Our daughter also attends a Waldorf style “school” where they help cut all the veggies for the soups and help make the foods, which definitely entices them to dig into what they’ve created as you mentioned. These are all great tips for children and adults alike- advice we should ALL adhere to! Oh, how wonderful for your family to be raised with such healthy foods like this!! AND how I wish they had a school like that around my place!! Love your thoughts on “no snacking” and “French Kids.” GOOD words for parents. And for us older folks who have spoiled our appetites by all the junk we eat! This is great!! I have to say I am trying to get my husband to adhere to the no snacking rule before our little Bug gets old enough to join in. I want to teach her healthy habits early on, but I agree if the snacking comes in the form of vegetables then go ahead!! The funny part is that my daughter, at just 8 1/2 months old, would rather eat vegetables and meat than fruits! I think that’s funny, but I love my veggies, and there are much worse things in the world!! Good luck and I am glad you are trying to teach your kids healthier habits. Even though I think your new blog look is great, I am having a bit of trouble navigating the older articles. At first I was so impressed by the change that I tried to contact the company to see if I could get them to help me use one of their themes. I never heard from them. Great post with lots of practical ideas. Oh, I need to go try that one out!! I am going to start trying some of these in our daily routine! Thanks Sasha! Very helpful! My kids won’t eat veggies. Thankfully they like to drink them and I blend fresh juice daily. I will try some of these suggestions and bite the backlash bullet! Ha!